Huawei is promoting its new Mate handsets. Chinese smartphone maker Huawei recently stole Apple’s crown as the world’s second biggest smartphone maker on volume. But it’s still keen to position itself as a scrappy young upstart, jabbing away at the larger, trillion dollar Cupertino giant. With that goal in mind, the Chinese manufacturer today trolled Apple at the launch of its iPhone XS and iPhone XS Max. How? By parking up a Huawei van outside Apple’s flagship retail store in London to engage with prospective customers. 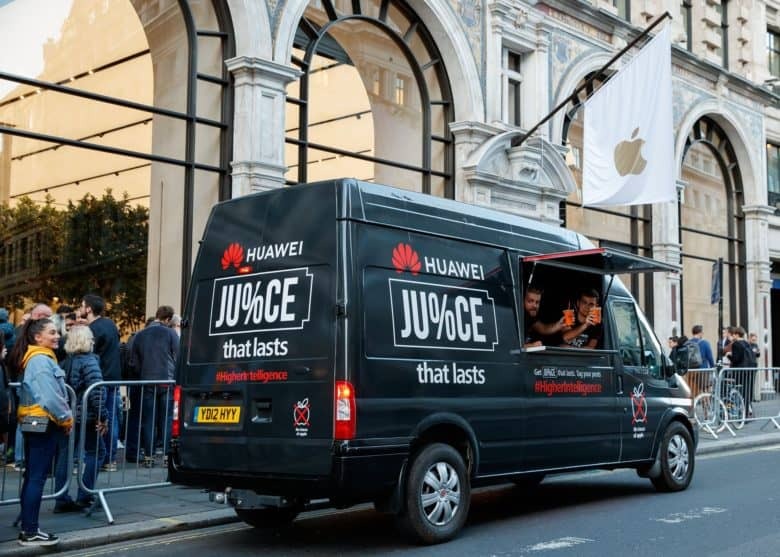 The Huawei van served juice to passers by, featuring the taglines, “Get ju%ce that lasts” and “No traces of Apple.” These were in reference to the battery life in its handsets, which it claims run for longer than the iPhone. It also offered charging capabilities for anyone who wanted to juice up their phone battery. Huawei will show off its new Mate 20 handsets on October 16. This isn’t the first time Huawei has taken shots at Apple. After Apple’s unveiling of the new, next-gen iPhones, Huawei fired off some sarcastic tweets, thanking Apple (though not by name) for, “keeping things the same” with its new phones. Despite Huawei’s efforts however, we do indeed see Apple keeping things the same. And by that we mean capturing upwards of 80 percent of all smartphone profits, regardless of whether others manage to ship more physical units. Ultimately, we have to give props to Huawei’s marketing stunt, though. After all, it wasn’t that long ago that Apple was doing the same to try and knock more established companies off their perch: whether it was congratulating IBM on entering the PC business back in the 1980s or pitting Macs against PCs in the iconic ads designed to take Microsoft down a peg. After all, the stronger the competition between companies, the better off us consumers will be!